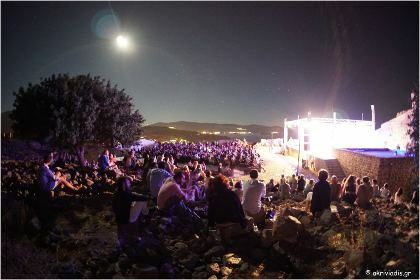 The Molyvos International Music Festival (MIMF) is a unique project located on Lesbos island in the Aegean sea. In a location recently noted mostly in context with the European refugee crisis, the MIMF sheds another light on an island which has always been a meeting point for civilizations. By bringing together the greatest international young talents for a four-day celebration of world-class classical music the MIMF highlights the value of cultural diversity. 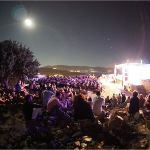 Utilising the timeless allure of Molyvos, MIMF presents classical music in an enchanting village setting. At a time of global economic and social crisis, MIMF demonstrates how music can still inspire, connect and unite people, welcoming audiences and musicians from around the world. 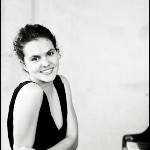 Its emphasis on bringing together outstanding soloists to create new chamber ensembles symbolises harmony between nations. FK: On the four days of MIMF, you could witness a special atmosphere, which you could also feel in the audience. What makes your festival different to others? What is unique about it? DD&KD: First and foremost, the combination of an enchanting location with classical music: It’s offering incredibly varied opportunities through this magical and thoroughly historical place. Just think, the town came into existence in antiquity. That so many people are involved and get together to introduce classical music of such high quality at this small place also makes it unique and intimate. The audience can get close to the musicians at the castle or at various central locations in the village when they play spontaneous little concerts. It’s very rare to find this closeness, the town is so small that you can get in touch with everybody immediately. And you will see each other during the day in vacation mode with shorts and flip-flops. That’s also very nice for the musicians, because they want to be authentic at this place and exchange views in a casual atmosphere. The musicians gain impressions that they don’t get elsewhere. The collaborations are more intense, the bonds are getting very close and enduring. You create a mutual language together – not just in a musical sense – and you become a family. Other musicians are hearing about this great opportunity and that’s why we are getting a lot of proposals throughout the year, even if it’s well known that we can’t pay high fees. But we invite the musicians and decide who fits the festival best. The human attributes have to match, but also the playing technique and performance, and it’s not granted that all this comes together naturally. But the musicians who are already on a high level are, from our experience, also the most uncomplicated and fitting to the community, because they don’t need to prove anything to anyone any more. FK: The festival is a non-profit project and cannot offer high fees. 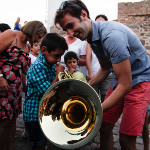 What do you think is bringing the musicians to Molyvos, even if there schedule is already packed?? DD&KD: That’s what you have to ask the musicians: Benedict (cellist, musician of MIMF, who was there during the interview), what do you think? Benedict Klöckner: The atmosphere and this especially magical place, where you can have a lot of pleasure aside from the rehearsals and hard work. Musically as well as humanly, this festival is a special experience. The whole package of music, interhuman relations and the historical place draw us here. Additionally it is, of course, the overall goal to achieve the highest musical level together; at the same time, the uniqueness of this place is present all the time. The goal to route classical music to this place is important to all of us, including the methods by which it is happening. DD&KD: The musicians therefore have a much larger responsibility, because the audience is letting something into their hearts that they might otherwise have not. You are no less nervous just because the audience doesn’t know about classical music. We have the responsibility to reach the audience with our programme long-term. So the musicians who just want to play for a higher fee don’t fit to the idea of the festival anyway. FK: Molyvos Festival is not a short term project. What is your future vision for your festival? Where do you see yourself in five years? DD&KD: With the festival we want to establish a classical music culture on Lesbos, like the one that exists in Germany. That, for example, knowing Beethoven becomes a natural thing. Moreover, we want the festival to support the regional development of the island in the short-term as well as the long-term (including changes at the visitor level), while attracting people who come specifically for the festival and the music. These people wouldn’t otherwise have thought of travelling to Lesbos. We also want to route classical music to Lesbos through the festival and through educational projects, and therefore go into schools to attract the kids permanently to classical music. To play an instrument is important, it challenges the cerebral and emotional skills. What other activity is better for kids than to play music? It’s also important for us to gain an international and loyal audience and bring them to Lesbos. We want to make the festival as popular as other European festivals and establish a unique concert experience. The musicians are already here and create music on a high level in this very special place. As we’ve already witnessed this time, it’s not a surprise that the audience is welcoming the festival so much. Traditional Greek music is cherished very much in Greece, so the awareness for the significance of music is already existing. The castle here in Molyvos could also be used for interdisciplinary programming, maybe we could also implement masterclasses, competitions or a newcomer award at some point. FK: Festivals are important to bring musicians together with the audience outside of the usual concert halls, because you can experiment and develop your own concepts. What do you think is especially important in regards to other festivals you are invited to and which festivals attract you most? DD&KD: Innovative festivals are very interesting, e.g. Podium Festival Esslingen (Danae was invited two times). It’s not always the most important thing to have the biggest audience possible, even very intimate concerts with only 80 people can be a very special experience: for example, at Podium Festival Esslingen you could experience a forest not only through music, but with all the senses – sight, smell. The concert experience is very important, and you have to create something that makes live experiences more attractive than consuming CDs. New audiences need to be found and therefore a festival can reach people beyond the ‘season-pass’ audience. Also, interdisciplinary festivals (with dance and video) are exciting; so too are concepts such as those at TONALi in Hamburg – they’re especially impressive with the intensity that they attract young audiences. To reach kids and young people is a huge goal. That’s why we also include programme elements like “Classic Goes Clubbing” and offer a Young People’s Concert”, where children participate actively during the concert, can try the musicians’ instruments and are allowed to play their music. Furthermore, there are the so-called “Musical Moments” which take place at unusual places within the town to surprise the people like a flashmob. Established festivals are also important of course, especially their side activities such as school projects and kids’ concerts. This all has to happen on a high level; high quality needs to be the standard, because that's the initial entry point and the audience notices the difference, even if they have never had access to classical music before. In the end we want to have an audience that is able to understand and enjoy our music. FK: What would your ideal audience be like? DD&KD: First and foremost, a mixed audience in terms of age, ethnicity, educational level, classical and non-classical people…in such an environment, a new way of hearing is created. It was great to see that this year already people were attending for the second time. The focus of the audience here in Molyvos was great, even under difficult circumstances to be outside, because of the wind. Even at the young people’s concert we were surprised. FK: If you would be truly free and independent from the expectations from the outside to make decisions, how would the festival and programme look like? Would you try out more adventurous stuff? DD&KD: On this island, you first of all have to build a basis, because most people only rarely get in touch with classical music. Therefore, the priority doesn’t lie on experimenting with formats. But on the other hand, the audience is also open and free and that also gives us the chance to try out more, because there is not that big weight of expectations lying on our shoulders. The main task here is to convince the people and to make them enthusiastic about classical music. It’s not mandatory to be totally innovative to convince the younger generation. It just has to be an inherently consistent programme to reach the audience with enthusiasm. That’s why it is important for us to introduce the pieces of the programme. The relationship to the audience is getting very personal in that way. In Germany it’s more difficult, because the people expect some previous knowledge and are too shy to confess if they don’t know specific pieces. But often they are grateful if we talk about the pieces before the concerts. FK: What do the terms “classical concert” and “chamber music” mean to you? DD&KD: Chamber music as a greater model is very important for us here at this place. Each musician has their place here and it creates respect and openness towards everybody. The joint work and creativity, no matter where you are coming from, leads to a very special community. We are searching specifically the intimacy that is embodied by “Hausmusik”. Historically, “Hausmusik” meant primarily to enjoy making music together. That is, the creative and emotional involvement with yourself and your fellows. Especially in that sense, chamber music can contribute a lot. Such a function is also found in team sports, that’s very important for young people. That’s why it should be more supported by schools, especially chamber music. Everyone has to listen to everyone else. At the opening of the festival, the Norwegian ambassador said “Everybody should be a chamber musician!” Classical music in general, and specifically chamber music, means open people to us, because you are always at eye-level, regardless of age or origin. That’s not the case in any art form! Classical music can bring together the most different political and religious positions and mindsets. FK: How do you want to reach young people? How did you enter classical music? What do you want to pass over to the younger generation? DD: I got into the piano by accident. I was four years old and attended a birthday party of a ballet friend. There I heard a girl playing piano and I was enthusiastic from the first second and wanted to learn that as well. The practicing was very playful at first, for about half an hour a day, but became much more intense very fast. When I was taking classes at Kämmerling in Hannover at the age of ten, it was clear in what direction this was leading. Because traveling from Düsseldorf to Hannover every weekend beside school is not because of having a hobby. KD: I was surely inspired by Danae. When I was one year old, I saw my sister playing the piano and could witness everything. Our parents were sceptical at first, they wanted me to start something different than what Danae was doing. They even tried to convince me to play tennis. When this was not really inticing me, they tried to convince me to at least play a different instrument, but they couldn’t stop me from playing the piano. Nowadays, young people’s iPods are full of the most diverse genres, such as jazz, pop, rock, hip-hop etc., but why does classical music not belong to the list? In Germany, classical music still doesn’t coexist with other genres on an equal level, because it’s still considered as “E-Musik” (serious music) in a separate niche. Therefore, it’s important to us to get rid of the prejudices people have with classical music. Of course not everybody needs to listen to classical music, it’s still a question of musical taste, but classical music should stand equally in that row of genres. It shouldn’t be forced with classical music hit parades, but instead “real” classical music should be played, even if the pieces are longer or more complex. The audience shouldn’t be underestimated, instead they should be challenged. DD: Once I played in a school class (in a class of so-called behaviourally-problematic children) a virtuosic piece of Liszt and a more bulky piece by Janacek. Afterwards I asked the children which piece they liked more. The surprising answer of a small boy was Janacek! He explained that his mother died not long ago and the piece reminded him of this difficult period. With classical music you can address all different emotional facets and that’s especially important for the development of children and young people. Pop and club music tend to be numbing and the songs are of a more simple structure to match the commercial needs of being easily recognisable. In the so-called problematic schools we often experience that children are absolutely open to challenging music. In general, the audience deserves to witness “real” classical music, not just “light” classical music. You have to trust in the audience, and first and foremost we want to create the next generation of classical music lovers that we want and need: they shouldn’t just desire classical music “to chill” and stop listening beyond that or even leave the concert halls. 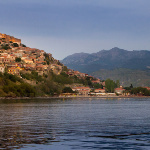 FK: What are the next plans for the upcoming festival at Molyvos? Are you talking with and amongst the musicians about what you could improve and what you would do differently the next year? DD&KD: We are working very closely with the musicians and are exchanging ideas and concepts. Additionally, we have an advisory board consisting of Jochen Sandig (Radialsystem V Berlin), Andreas Richter (Andreas Richter Cultural Consulting GmbH), Lars Vogt (pianist, conductor) and Marlis Peterson (soprano). The programme will be put together with the other musicians. Sebastian Manz (clarinet), for example, is a huge source. Once we have a selected a broad topic, he sends us a long list of pieces and also arranges some pieces. This year we had the topic of “crossroads”, because it fits to the current European situation, and it also should stand for a bridge between people with different origins. 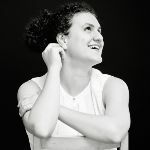 The programme doesn’t have only pieces of traditional western classical music such as Mozart, Dvorak, Brahms or Bartok, but also enhances works of composers of new music from Greece or contemporary Israeli compositions, and this year we had a world premiere of a piece from a young Greek composer. In addition, there are pieces that go beyond genre borders, where classical music touches jazz, rock, techno or tango music. We never want to choose a topic that just focusses on a specific composer, but something that concerns people in a broad sense. Apart from that, there are plans of a more practical nature, such as how to improve the stage and find additional solutions for the wind here at the castle, which was already improved by our technical supervisor Titos Kariotakis and brilliantly managed by the professional sound engineering of Kaspar Wollheim (sound engineer of the RBB), who also recorded every concert. Ending we would like stress that the high quality outcome is the result of the carefully organised planning and execution of the whole Festival team.